With a name like ‘YogoBerryLicious,’ it must be tasty! Today we have a simple, sweet, delicious treat to brighten your day! Here in the Mid-Atlantic, we’ve had some ugly, rainy weather, so a healthy, homemade popsicle with NO SUGAR ADDED is just what we needed to make it feel more like springtime. And there’s no need to search for this recipe in your files; it’s easy to remember. Blend 1 cup yogurt (we like Stoneyfield Farm or Trader Joe’s Organic French Vanilla), 1 cup frozen fruit (we used Trader Joes’ Mixed Berries) and 1 or 2 Tablespoons of honey (for these, we used 1). We bought the popsicle molds for $1.99 at Ikea – not that we were at Ikea to buy popsicle molds! – but small paper cups work just as well. When you fill up the paper cup, cover it with a swatch of foil, put in a popsicle stick and freeze. Rip off the cup or run warm water over the outside of the mold for a few seconds to release the popsicle. These are not only healthy treats, but ever so simple to make, and fun for all ages! 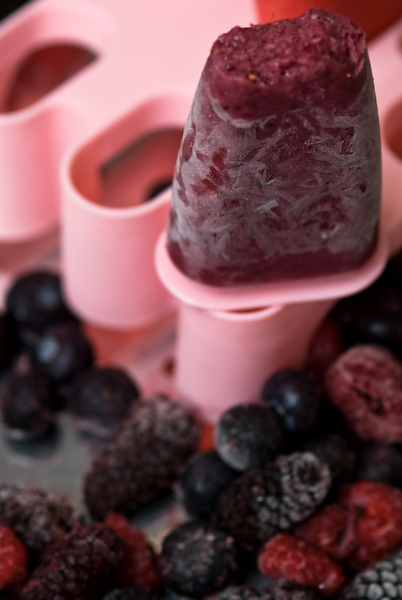 This recipe is a refreshing alternative to store bought popsicles and incorporates antioxidant rich berries with a mini calcium boost of yogurt, and a hint of sweet from honey. Raspberries are a great source of Vitamin C, manganese, fiber, folate and potassium. Try different flavors of yogurt, various types of fruit and even fun ice cube molds in shapes like stars, fruit or shells. In miniature, they would make a splash in a party punch. How Stacey Got the Shot: In the kitchen with the 105mm macro lens at f/3.5. Bounced the flash and captured the photo in 1/125 second. Great, easy recipe and brilliant shot! I will be making these this summer, for sure! They look crazy tasty! Great recipe. I’m trying it as soon as I can. Love all the ingredients.